It's Halloween everyone, and that means spooky treats galore. As well as gorging on candy, it's also a time to indulge in scary films and TV shows (I know I'm going to continue binge watching Stranger Things). But what about games? 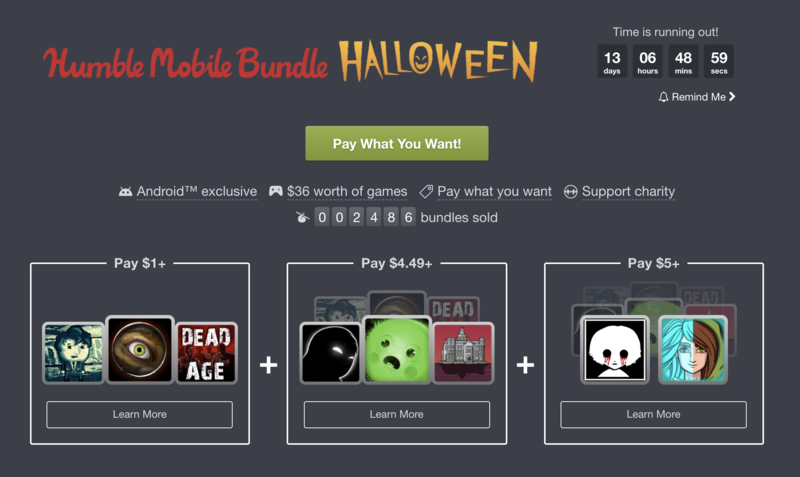 Thankfully, Humble Bundle has got us covered with a Halloween-themed selection of discounted Android games. This is sure to be its most terrifying bundle yet. You probably know the deal with the Humble Mobile Bundle by now, but just in case... You get varying numbers of games based on what you pay. This time there are eight up for grabs. If you pay at least $1 (£0.76), you'll get DISTRAINT: Pocket Pixel Horror, Sanitarium, and Dead Age. Pay more than the average, which is $4.48 (about £3.39) at the time of writing, and you'll get the previous three, plus Beholder, Bulb Boy, and Rusty Lake Hotel. If you stump up $5 (about £3.79) you'll get the whole lot, as well as Fran Bow (all five chapters) and Whispering Willows. The prices vary, but it would cost $36 to buy them all individually, so it's certainly worth going for. The games come DRM-free, as usual, and the Bulb Boy soundtrack is also thrown in as a bonus for those paying more than the average. Of course, for just 50 cents more you upgrade and get all of them, so bear that in mind. The deal will only be live until November 13th, so don't leave it too long. You can also choose what proportion of your money goes to the devs, Humble itself, and a charity of your choice, which is a nice touch.